Derek Dollar's earliest culinary inspiration stems from Sundays spent in the kitchen with his mother. "My mom would bake a cake every Sunday. She would put my younger brother down for a nap and bring me into the kitchen to crack eggs. Whether I knew it or not, that is when I caught the bug," he recalls. Originally from Orlando, Florida, Dollar moved to Atlanta when he was 11 years old and worked in local restaurants while in high school. After graduation, he was on track to attend college as a business major, but his love affair with the restaurant industry compelled him to attend culinary school at the Art Institute of Atlanta instead. After completing culinary school, he worked at Rainwater restaurant in Alpharetta under chef Jay Swift, who took Dollar under his wing and became his mentor. "Jay was the one who inspired me to get into finer foods," he says. His desire to continue a fine dining career led Dollar to join the Milton's Cuisine & Cocktails team as sous chef in January 2011. 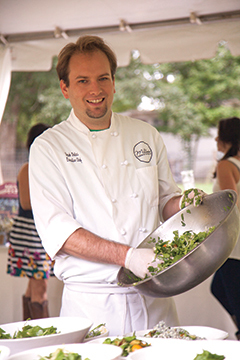 Two years later he was promoted to chef de cuisine and quickly became the restaurant's executive chef in 2013. He has since gained a reputation as an inventive and uncompromising chef who demands the very best and keeps his own plate quite full in the process. When The Big Ketch Saltwater Grill opened in Roswell in October 2015, Dollar was appointed to oversee that kitchen as well. Now he brings his plating style and inventive daily features to both of these Southern Proper Hospitality restaurants. In addition to the traditional executive chef responsibilities, Dollar chooses which produce is planted in Milton's Acre, the large private farm on the grounds at Milton's restaurant, and how to utilize the garden's bounty each night. This process serves as a daily inspiration for Dollar's menus from May through December but has also posed an interesting challenge for the chef. "In the middle of July when it's pumping out a thousand pounds of food, the garden can become overwhelming," he admits. "Integrating what we harvest into a daily menu has made a world of difference in maximizing the use of our crops and minimizing waste." A sense of community plays a big part in Dollar's role at Milton's, where he designs an almost weekly schedule of events throughout the year, and is evident at The Big Ketch Roswell as well. "We have a fantastic front yard at The Big Ketch to host group gatherings," he says. "Downtown Roswell is a tight knit community, and that's the type of neighborhood where I grew up. I want to offer a lot of opportunities for bringing neighbors together in this historic district." Dollar resides in Woodstock with his wife, Lisa, and their two children. When he's not at Milton's or The Big Ketch, Dollar enjoys dedicating his time to events that benefit the communities where he works and lives.